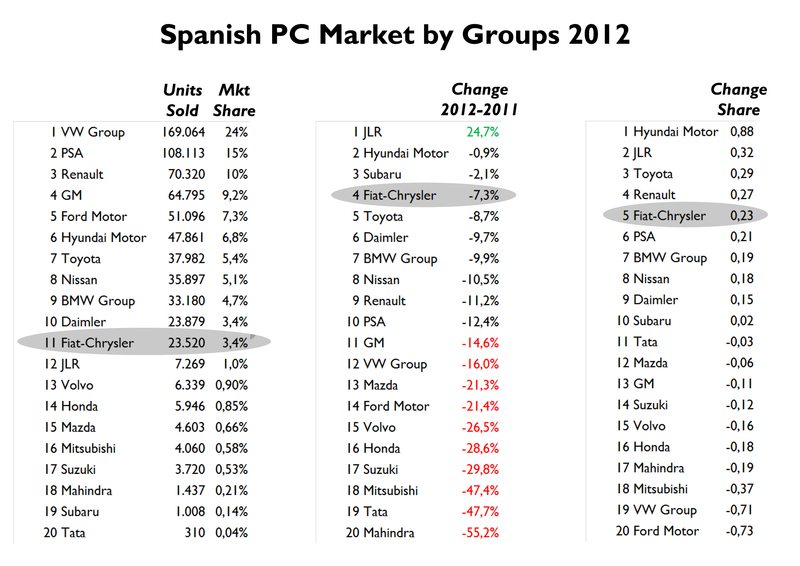 There are 2 different approaches to analyze the position of Fiat-Chrysler in Spanish car market. The positive one is that it was one of the few car groups to increase its share in this troubled market. The negative part is that the group occupies a very small position compared to its rivals. 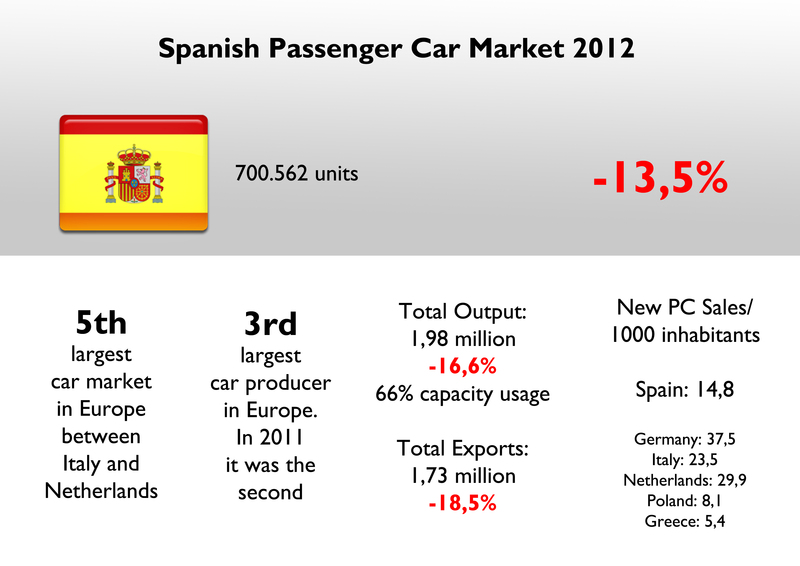 Spanish car market crisis is one of the worst in Europe, and after a terrible 2011, sales registrations in 2012 were not as bad as a year earlier. Still, the market had the worst result in the last 25 years and now is somehow close to Netherlands market and is behind Argentina, Mexico and Saudi Arabia in general ranking. In terms of change the market is down 14%, which is more or less the same result of France, but is better than the collapse in Italy, Greece and Portugal. It will be very difficult to go back to those years when Spanish bought more than 1,4 million units per year. Despite this problem with demand, Spain continues to be a very important car producer occupying the third position in Europe, after Germany and France. Last year the market composition didn’t change a lot. VW continues to rule with almost 1 out of 4 cars sold in that country. French from Renault and PSA complete half of the market and the remaining part is mainly owned by Americans, Germans and Asians. Spanish demand is a bit like Greek one in terms of preferences: a lot of buyers love the premium products even if they are much more expensive. This explains why cars like the BMW 1-Series or Audi A3 occupy an important position no matter the crisis. Nevertheless, most of brands’ registrations fell in 2012. But there are differences with other European markets. The first one is that VW Group’s sales fell more than overall market, so Spain was one of the few European markets where the German group lost market share (actually it was the second group to lose more market share, after Ford). 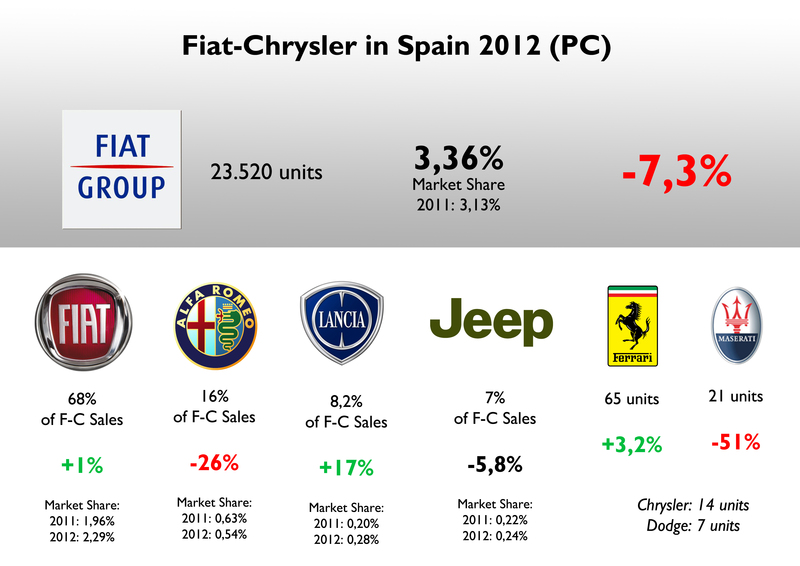 On the other hand, Renault, PSA and Fiat gained market share. Hyundai, as everywhere in Europe, was the best performer gaining 0,88 basis points share. Ford, GM (Opel) and VW (Seat) were the bad face of the crisis. The best-selling segment is ‘C’ one, with 27% share, and is closely followed by B-Segment with almost 26% share. SUVs close the podium with 18% share, which is the same percentage of Austria, and is higher than the share in Germany, France, UK and Italy. In the opposite side, E and F segment have a very low penetration, while citycars are not popular at all. 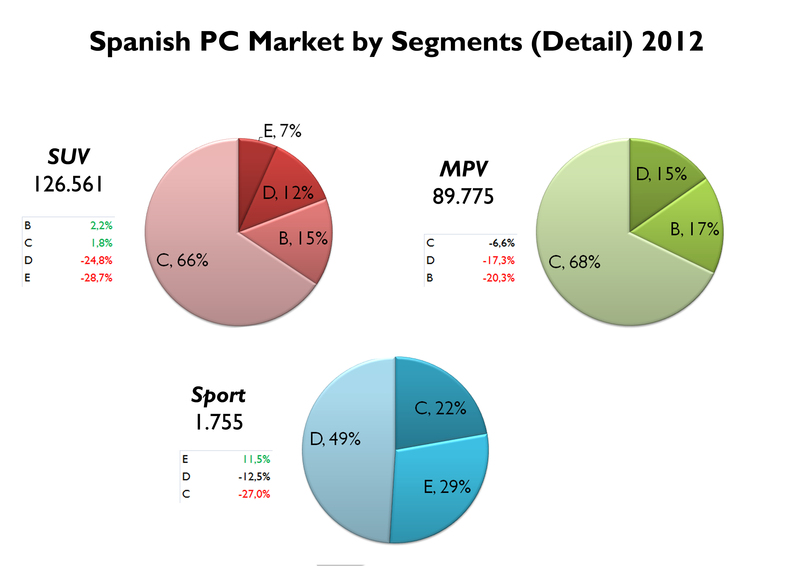 Actually, Spain is one of the few European markets where A-Segment cars don’t count for more than 5%. The analysis doesn’t include LCV. The scenario changes a lot when analyzing the segments by change. In 2012, citycars had the best positive growth, up 17%. In fact it was the only segment to increase its registrations year-on-year, as SUVs declined 5% because small SUVs segments’ (B and C) rise wasn’t enough to offset the fall of larger SUVs registrations. Large passenger cars and SUV had the worst falls. Fiat-Chrysler did well in terms of share but its registrations are extremely low, and is not even in the top 10 by groups. 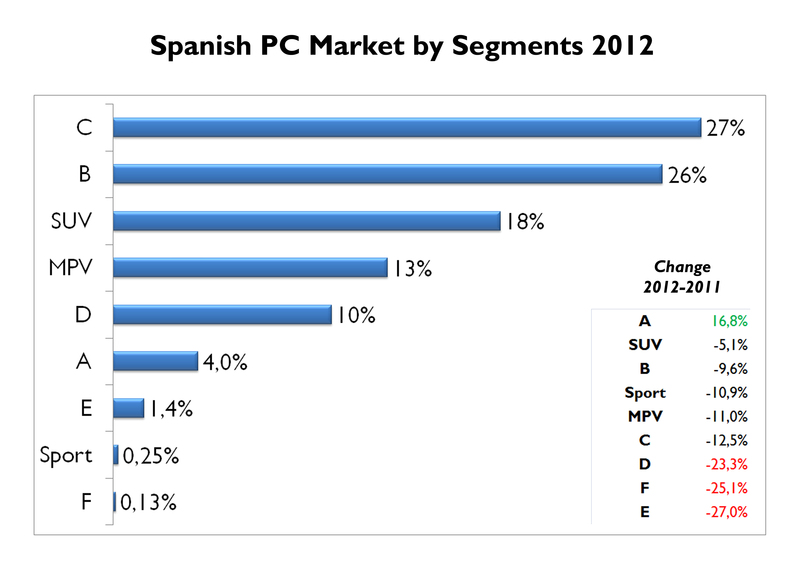 It isn’t only behind the mainstream Germans, and French but now is behind Hyundai, Mercedes, BMW, Nissan and Toyota. Despite its position in the ranking, Fiat-Chrysler’s market share is better than the one in Germany, France or the UK. Compared to 2011 figures, the group’s sales are down 7,3%, and is explained by Alfa Romeo’s drop. 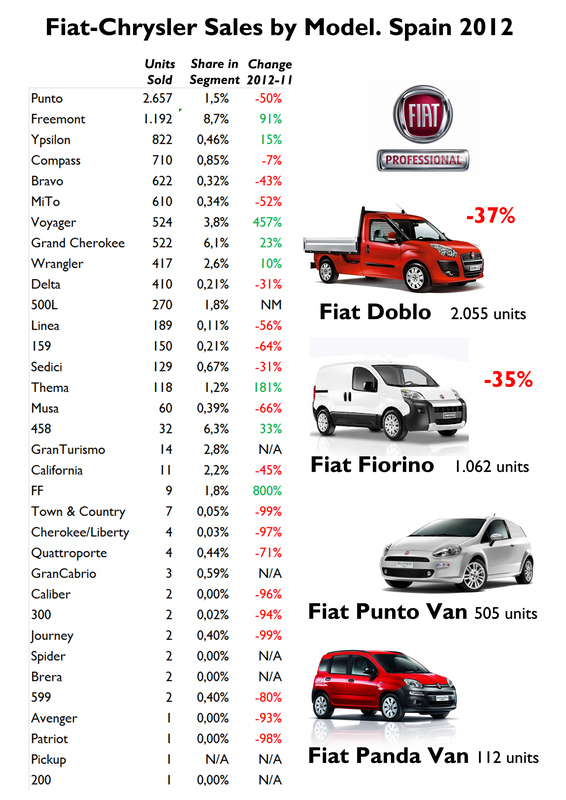 Fiat brand managed to increase its sales by 1% and overcame Chevrolet and Skoda in the ranking by brands. Of course, there is a direct relation between the rise of A-Segment sales and Fiat, as it is the absolute leader in that segment, which was strongly influenced by the good result of Panda/500. 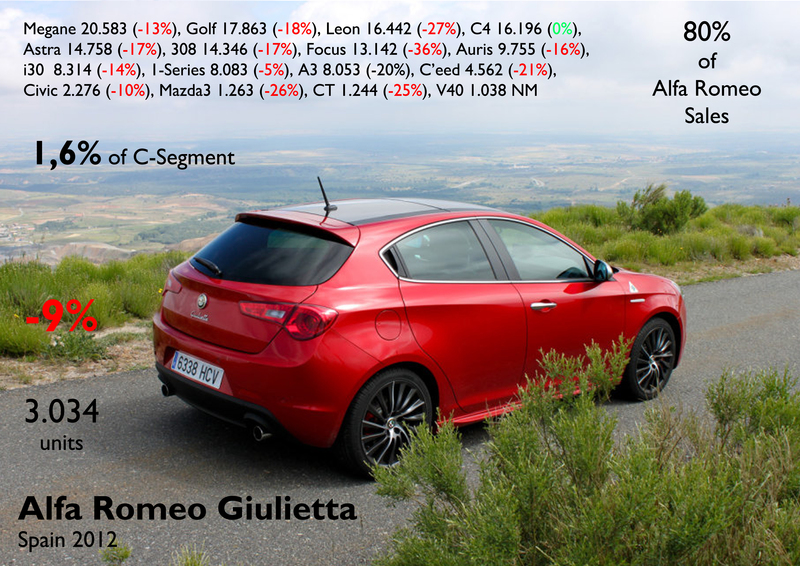 Alfa Romeo did very bad specially because of the MiTo, down 52%. Lancia’s sales are up a healthy 17% while Jeep’s are down 6%. In other words, Fiat-Chrysler’s fall is mainly explained by one model, the MiTo, as the 500 and Panda’s good result was enough to offset the fall of the Punto, while Lancia and Jeep sales combined were up 5%. Contrary to what happens with total market by segments, the group’s sales rely on A-Segment, counting for almost 41%. Then comes B-Segment with 18%, not far from C-Segment with 15% share. Is not usual this to happen as normally the Punto beats all C-Segment cars of the group. But not in Spain where last year the Giulietta was few units behind the Punto, and the Ypislon wasn’t far. LCV Fiats are also important for the mix sales of the group, but not SUVs and MPVs which have still marginal shares. Regarding the position of the group within each segment, it rules in A-Segment, and is a key player in D-MPV and E-SUV. The 500 was the best-selling nameplate of the group counting for 22% of total sales. It is followed by the Panda, Giulietta and Punto (Spain is the only market where the Giulietta is more popular than the Punto). 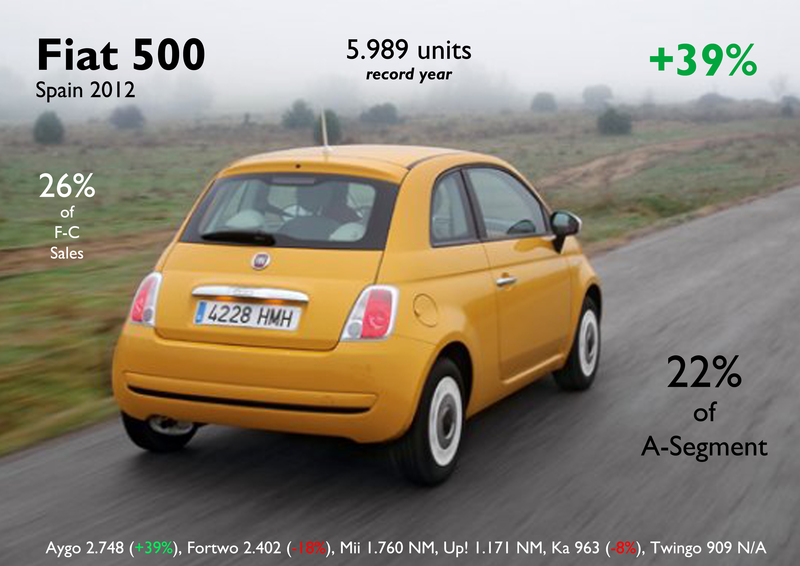 The 500 was also the best-selling city car, up 39%. 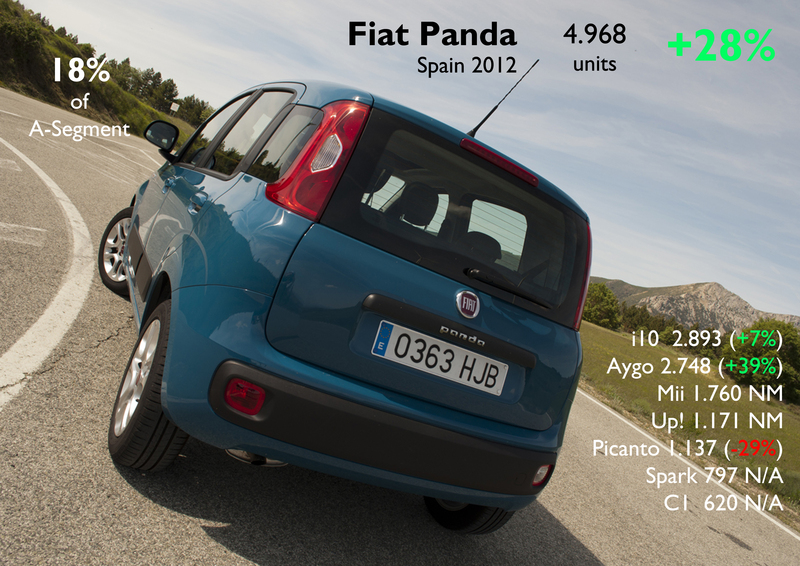 Along with the Panda (+31%), both models managed to rule in their segment without any problem with competition (the Up! and Mii are complete flops). The Freemont had also a good performance, almost doubling its 2011 results. The Ypsilon, Voyager and Thema did very good, albeit their low figures. Too bad for the Punto, Bravo, MiTo, Delta and Linea. The 500L had a good start with more than 270 units sold in 3 months, allowing it to control 1,8% of B-MPV segment. 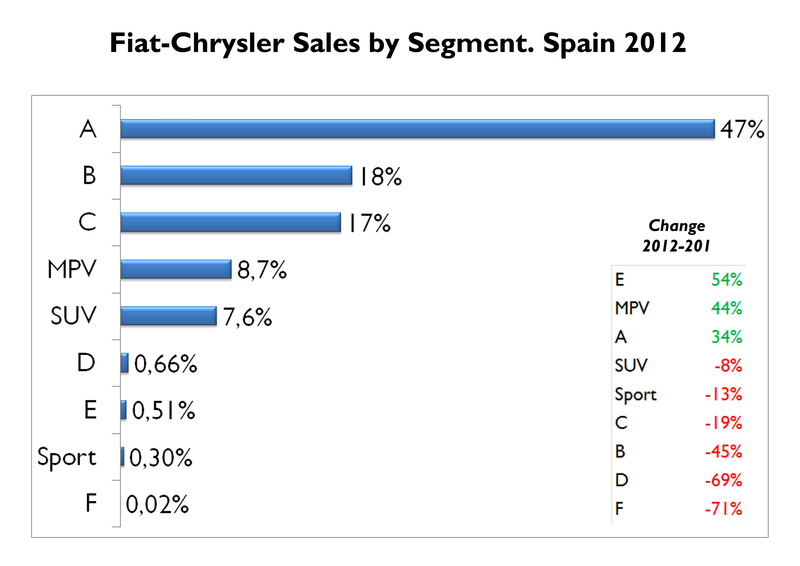 In total, Fiat-Chrysler position in Spain is not so big because it depends a lot on two models that rule in their segment but are not part of what most Spanish look when buying a car. Spain shows how the group is being displaced in upper segments, forcing it to boost its position in A-segment, and therefore, increasing the dependence on the 500 and Panda. The future must be determined by the success of the 500L which must succeed not only as a mini MPV but as the temporary successor of the Punto. As no other significant new products will arrive soon, future result will depend on how Fiat manages to keep boosting 500 and Panda’s sales.